An incomplete lead alloy early medieval (Anglo-Saxon) brooch of uncertain form. The remaining fragment has a (now) sub-rectangular plate with a one raised lower end which may have arched into a bow, as the bend seems purposeful rather than the result of damage. The front of the brooch is decorated with a central raised, cone-shaped pellet and is surrounded by multiple small pellets arranged in three or four rows around the main pellet. On the reverse of the brooch are two raised triangular lugs, probably the lugs for a hinged pin. Parallels have been difficult to come by - The decoration can be compared to that seen on late Saxon brooches, for example NMS-EA39D6, SF-AE4D73 and SF-CCF226. 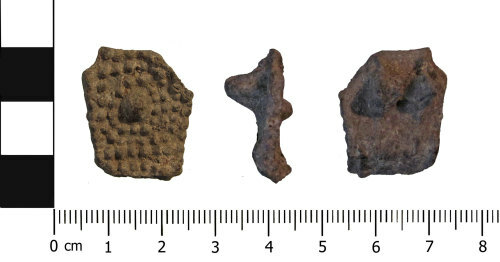 A disc brooch from Beachamwell in Norfolk (Weetch 2014 figure 13.3c) has the same beaded decoration. All of these examples date to the Late Anglo-Saxon period (c. AD 850-1000). The raised edge is more suggestive of an earlier brooch, like a cruciform for example (c. 5th century AD) but the decoration isn't consistent with lead examples of this type. Therefore, based soley on the decoration, it is suggested that this brooch fragment is of the later date.